The fruit, flowers and fowl of European still-life painting are on view at the National Art Center, Tokyo. Heat exhaustion might be enough to lure you to this show. The promise of clear Northern landscapes, dark interior views, and pale, un-sweaty people sounds like heaven in the midst of Tokyo’s cruelest month, and heaven it is to plunge into the air conditioning through the faux-marble archway marking the entry to NACT’s special exhibition room. All of these paintings are on loan from the Kunsthistorisches Museum in Vienna, and the gallery has been transformed into something that loosely evokes European halls of culture: deep paint colors on the walls, large flower arrangements, and waltzes playing in the gift shop. Still you won’t find much English here, aside from the plaques identifying each painting, so those interested should borrow the audio guide. The show is loosely organized around different strains of still-life painting, a primarily Dutch pursuit although painters of other nationalities are represented. The focus is partly on the historical development of the genre, but the curators also emphasize the importance of allegory and visual shorthand: a rose is not just a rose but also a symbol of romance, youth, and beauty. A skull is also not just a skull: the exhibition’s first grouping includes a series of vanitas paintings, variations on the theme of mortality and life’s fleeting pleasures. While the Japanese celebrate a similar concept by getting drunk under the cherry trees, these dour Northerners get at the idea a bit more literally with skulls, hourglasses and other reminders of the grave. By far the best executed of these works is Peter Gerritsz van Roestraten’s ‘Vanitas Painting’, in which shelled walnuts stand in for the human brain while other objects—a metal chalice, a violin—glimmer in the murky background. 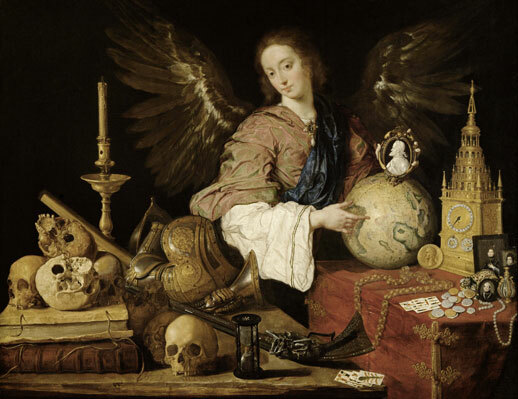 The Allegory of Vanity by Antonio de Pereda y Salgado belongs to the same group, but here the subject has more to do with the pride of empires than that of individual man. In Salgado’s large canvas a winged goddess sits surrounded by the spoils of colonization: a globe, a clock, precious pearls and coins. But nearby are the tools on which that tribute depends – a rifle and a suit of armor – and the inevitable skull serves as a reminder that even national pride but shortly precedes a fall. But wait, you say, we were promised pretty pictures of flowers and fruit! That is, after all, what still life is known for. Don’t despair; the archetypal images are here as well. The loveliest are probably Jan Anton van der Baren’s ‘Vase of Roses’ and the better-known Jan van den Hecke’s ‘Vase of Flowers’. Hecke’s painting includes several of the exotic tulips that inspired such a frenzy of excess in mid-seventeenth-century Holland, when bulbs went for many times more than an average yearly salary. Once again the curators remind us that in art, a flower is never just a flower: the tulip is a symbol of luxury, an indicator of larger economic trends, and a product of international trade that had been only recently introduced from the Ottoman empire. Similarly, in the many images of game birds and animals after the hunt, the emphasis is on aristocracy and its pursuits rather than on the hunt itself. But it makes little difference to the animals, and the painters take advantage of the opportunity to do some incredible nature studies. A jaw-droppingly gorgeous example is Jan Weenix’s ‘Dead Hare’ of 1690, in which the textures are so lusciously rendered that the viewer almost doesn’t notice the macabre subject matter: a dead rabbit, strung up to drain, flanked by dead pheasants. In the distance, misty ruins recede into the forest. The peacefulness and beauty of the scene is almost enough to make anyone take up hunting. The blockbuster artists of the show are reserved for the last section, “Genre Scenes, Portraiture and the Still Life,” which attempts to show how small still life scenes are inserted into larger paintings as “attributes” illustrating the character or social standing of the people depicted. This is where you can find Jan Brueghel the Elder’s ‘Visit to the Farm’, a typically crisp Brueghel scene in shades of brown with pops of bright blue and red. 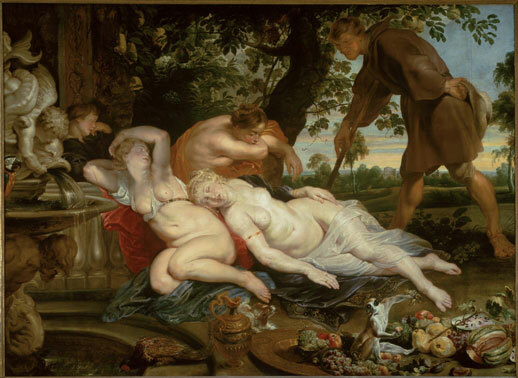 Just steps away is Rubens’ ‘Cimon and Iphigenia’, a fantastically fleshy pile of nudes dozing in the heat of an early summer’s day. 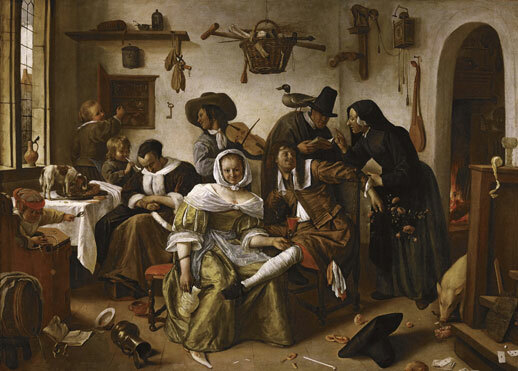 Jan Steen, that standard of every art-history textbook, is represented here by two paintings: ‘Beware of Luxury’, a preachy work showing the dangers of too much to drink and too little to do, and the similarly themed ‘Peasant Wedding (The Deceived Bridegroom)’. But the superstar of the show is Velázquez’s ‘Infanta Margarita Teresa in a Pink Dress’. Like his famous ‘Las Meninas’, the subject is a child of the Spanish royal family. Here she is depicted alone except for a vase of flowers including a few marguerites — a play on the little girl’s name, while the roses in the bouquet echo her flushed chubby cheeks and the pattern on her pink dress.